Sea World, Breast Cancer, and Tighty Whities. You’re probably wondering what the 3 things in the title have to do with each other. Well, if you’ve ever been to a place like Sea World or watched the movie Blackfish, you’re certainly familiar with what some call Floppy Fin Syndrome — how a captive whale’s fin flops over to the left. Floppy fins seldom happen in nature, where whales swim straight ahead while encountering the natural loads and forces of the ocean which keep their fins strong and upright. Meanwhile, whales in captivity always (for some reason) swim in their tanks in a counterclockwise fashion. Always to the left. Just like their floppy fins. Human beings like you and me aren’t much different. No, we don’t have floppy fins. But we do have our fair share of low back aches, trick knees, tight hamstrings, and neck pain, as well as the more serious stuff like cardiovascular disease and cancers. Because we MOVE like humans in captivity. Instead of swimming in circles, we sit in chairs for 12 hours a day. Then we try to “offset” all of that sitting by hitting the gym for an hour, performing all of nine movements that make our strong muscles stronger and our weak muscles weaker. Speaking of flopping, we modern humans like to wear special clothing to keep our man and lady parts from flopping around. But did you know that your body came equipped with muscles that support and hold these parts up for you? And wearing such clothing not only weakens these muscles, but the restricted movement of the tissue is being shown to increase the risk of breast and testicular cancer. Not good. No, I’m not suggesting you stop wearing underwear. 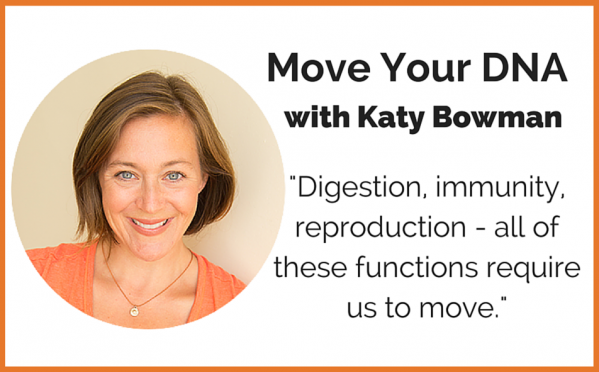 But I do recommend you check out this week’s podcast with Katy Bowman, author of Move Your DNA, to find out what you can do about it and how you can squeeze more movement into your busy schedule — at your desk, at home, in the modern world. Katy is HILARIOUS and the only person I know in the whole wide world who can make topics like biomechanics and mechotransduction fun. 4:10 – Floppy Fin Syndrome in captive whales and how it applies to you, me, and our DNA. 27:33 – What you can do at home or work to jump start your physical activity flatline. 29:42 – Is my standup desk any better than sitting at my desk? 32:54 – Why running on a treadmill and running over ground are two DIFFERENT movements. 38:28 – What REALLY pumps your blood. 42:32 – How arterial plaque is a good thing … well, to a point.